Want to use video advertising in your retail store to boost sales? 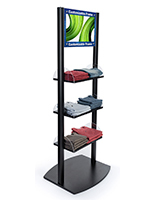 Our digital display racks use electronic signage to reach out to customers with dynamic . These floor stands are excellent for drawing attention to products and informing the public about new lines of merchandise. The digital display racks allow shop owners and brands to create dynamic presentations for their offerings like never before. Customers will get more information about merchandise while companies can create custom marketing campaigns that surpass printed media. 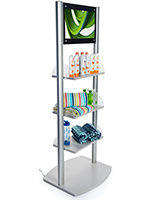 Use digital display racks to update your retail presence for the social media age. What types of merchandising fixtures do we offer? 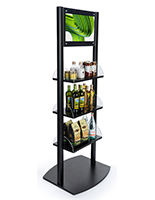 Digital display racks with shelves are excellent for selling a wide assortment of items such as makeup, clothing, and food. This shelving with electronic signage has an open design that allows customers to take what they want and go. What features are included with these models? Each stand has a 21.5" high definition screen for playing marketing material in crisp quality. This 1080p video shelving has a plug-n-play design to feature media from USB, mini-HDMI, and SD card sources. The merchandising fixtures have two speakers for attracting attention with audio messaging. These floor stands are available with custom printed borders around the screen. This is a great place for company logos and branding messages that create a professional marketing presentation. 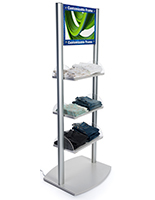 The electronic signage display racks have three height adjustable shelves made of MDF with clear acrylic sides. 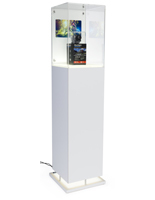 Our digital display pedestals are ideal for featuring upscale items like jewelry, watches, and smartphones as well as other electronics. These cases put the spotlight on exclusive merchandise with LED lights in the base. While customers can't access their contents, they build hype for the hottest new items. The illuminated pedestals also play dynamic advertisements on a video screen placed behind the subject. What else do these upscale floor stands do? 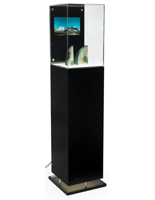 Each digital display pedestal has an acrylic top that protects merchandise from dust and fingerprints. This presentation makes any item look valuable and highly sought after, building interest with customers. The 10.1" screen is placed behind the product to attract attention to the showcase. Add appeal with ambient visuals, direct advertisements, or specifications for complex devices. Add custom graphics to the case to take advantage of your marketing space. The entire back panel is personalized with branding, surrounding the screen and creating an enticing backdrop for the hottest new items. Video advertising displays add a new dimension to merchandising and building brands. Companies can feature their personalized message for customers to give them the full picture. 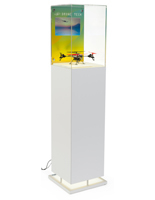 This is excellent for retail stores, trade shows, and malls, where a dynamic display will stand out from the crowd. We also offer literature holders with electronic signage to boost brochures, catalogs, magazines, and other publications. Create an attractive marketing campaign with our multimedia fixtures.